When relatives were visiting a little while back, I mentioned the possibility of cassowaries living in the rainforest at the far end of our farm. It’s dark and dense at the end of our block, and I always thought there was a chance it might be harbouring a cassowary. My relatives seemed surprised I even considered it a possibility – we were too far from the coast, they thought. Now I might have found that reassuring except that I knew there were cassowaries living not ten minutes from our place – other relatives had encountered them when staying at some accommodation near by. (*At this point, for people following the blog from overseas, I should probably clarify why I was a little concerned about bumping into a cassowary. Cassowaries are very large birds, between 1.5 and 2.0 metres tall – that’s about 5 to 6.5 feet tall. There are very few left in the wild, and are considered an endangered animal nationally (though some websites only list them as vulnerable). For defence and fighting purposes, they have a large claw on the back of each foot. Here’s what Wikki has to say about the claws, speed and swimming abilities of cassowaries (it’s like something out of a horror movie): “The second toe, the inner one in the medial position, sports a dagger-like claw that can be 125 mm (5 in) long. This claw is particularly fearsome since cassowaries sometimes kick humans and animals with their enormously powerful legs. Cassowaries can run at up to 50 km/h (31 mph) through the dense forest and can jump up to 1.5 m (4.9 ft). They are good swimmers, crossing wide rivers and swimming in the sea.” And here’s another little lovely little quote from Wikki about these birds: “Cassowaries are very shy, but when provoked they are capable of inflicting injuries, occasionally fatal, to dogs and people.” Charming. Yep. Cassowary spotted on our street! (P.S. The little creature in the diamond-shaped sign above is a tree kangaroo – and no, they don’t hurt you, they’re cute and very shy. We have one that visits our farm regularly these days). The second sign was attached to the original tree kangaroo sign after someone reported a cassowary sighting. That was interesting! 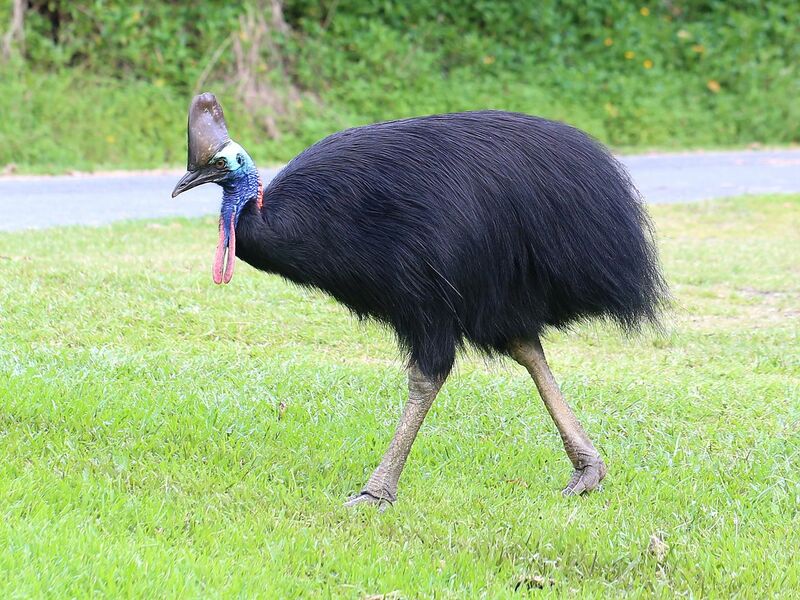 Someone must have seen a cassowary in the area and reported it. As I drove down the road, I noticed there were two signs – one about three minutes up the road from our place and the second about two hundred metres from our front door, presumably denoting the zone in which the cassowary was expected to cross the road. The next day the second sign was moved closer to our house and erected about one hundred metres from our front door. Over the next few days I kept an eye out and drove a little more slowly in the “cassowary crossing” zone but didn’t see anything. I began to think maybe the person who reported it had imagined the whole thing. Then one afternoon, just on sunset, I was driving home with the kids and saw something up ahead – a large shape stopped on the road. I slowed right down but it didn’t get off the road – a cassowary! I didn’t really want to stop the car (in case it decided to kick the car) but it wasn’t moving off the road and I really had no choice but to keep the engine running and pull to a stop at a safe distance away. We sat, staring out the windshield, as the cassowary wandered about the road in front of us before finally shuffling off into the bushes. The next day the neighbour popped by for a catch up on gossip and to drop off a bunch of bananas he’d grown. He asked me if I’d seen the mystical Cassowary that had prompted the new signs. Well, I could tell him I had indeed! Then followed a ten minute conversation on the colour, size, age and possible gender of the bird. Two juvenile cassowaries outside the houseyard! What the?!!! Two cassowaries, just outside the houseyard, and not ten feet from the house! The two birds circled the house, peering in at all the windows until we felt like goldfish in a bowl. They weren’t fully grown, juveniles, maybe only one metre tall. It was all fun and games, us able to observe them from the safety of the house until it came time to take the kids to school….and the cassowaries decided to station themselves at the car! We ended up forty-five minutes late for school (“Sorry we’re late, Miss. Held captive by cassowaries in our own home.”) The kids had a good story to share with their friends that day. Have a great week and I’ll write again soon. Whoa, crikey! I’ve never seen a cassowary but they freak me out. Those legs, man… They’re like a crazy, unpredictable muppet! I can understand your fear. 😉 At the same time, it would be very exciting seeing an animal like that in the wild. As long as there’s something between you and them. They’re a totally legit excuse for being late to anything hehe. It was kinda cool to observe them through the glass. They’re beautiful birds, very curious, and these guys seemed quite peaceful. That is so cool! No large birds up here in the US except as pets. I was surprised to read they swim! I can’t imagine what that looks like under the water. You’ve got me laughing here. Here’s wiki: “The blue-ringed octopus, despite its small size, carries enough venom to kill twenty-six adult humans within minutes. Their bites are tiny and often painless, with many victims not realizing they have been envenomated until respiratory depression and paralysis start to set in. No blue-ringed octopus antivenom is available yet, making it one of the deadliest reef inhabitants in the ocean.” Sushi anyone?